The sharing economy is all the rage across the globe, and of everything that is being be shared, bikes are of particular interest for city officials seeking to make their cities more sustainable with public transportation. Seoul, with an eye on becoming a green city and upgrading its mass transit system, rolled out a citywide bike rental system in 2015. Seoul Public Bike, or “Ttareungyi” in Korean from the sound of a bike bell ringing, was launched in September 2015 to allow anyone to rent a bike from 878 rental stands across the city. Presently, there are 11,600 bikes in the system. The city government plans to expand that to 20,000 bikes and 1,290 docking stations by year’s end. This will give Seoul the second most public bikes after Velib in Paris, which had 23,600 as of 2016. Seoul is well connected by bus and subway, and rental bicycles are particularly popular at places like bus interchanges and subway stations for use for the last-mile commute. From its launch through October this year, people used Seoul Public Bike over 5 million times, city government data shows. 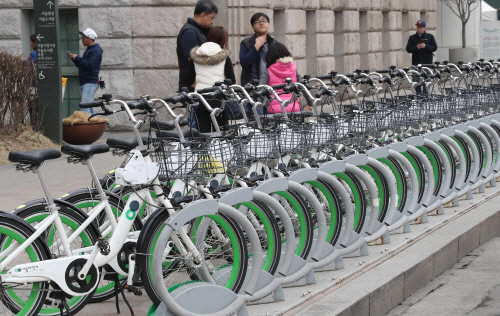 It also shows that the bikes have proved especially popular near Yeouido Park and Ttukseom Hangang Park, as well as in university areas like Hongik University Station. The number of users rose more than sevenfold to 231,000, with nearly 50 percent of the registered riders in their 20s. To rent, one has to purchase a pass through the service’s official webpage (www.bikeseoul.com) or via a mobile app. One can then book the bike online or through the app, pick it up from a rental station, ride and leave it at a different station. The website is available in English, Japanese and Mandarin, in addition to Korean. Ttareungyi docking stations are located 500 meters to 1 kilometer from each other to make renting and returning easy and convenient. Users are advised to bring their own helmets. For one-time use, the rental price is 1,000 won. Regular users can purchase a 30-day voucher at 5,000 won for one-hour use or 7,000 won for two hours at a time, while a 180-day voucher is 15,000 won for one hour or 20,000 won for two hours. In an odd wrinkle, a user can return the bike to any station within the one- or two-hour limit, and rent it again to restart the clock throughout the day. According to Rep. Kang Suk-ho of the main opposition Liberty Korea Party, the prices are set below operations and maintenance costs. The more popular the service becomes, the greater loss Seoul would suffer, Kang said. According to Seoul officials, as of the end of August, voucher sales amounted to 1.7 billion won ($1.55 million), but expenses spent on the system’s operations and maintenance totaled 4.1 billion won. The city explained that a large part of the money was spent on relocating bicycles and repairing and removing faulty or damaged ones. So far, there have been no reports of vandalism. While bike-sharing seems to be off to a good start, the biggest concern is the safety of users and availability of bike paths. To create more bike paths, the city government said the additional bicycle roads will be built across 84 kilometers by 2020 with a focus on safety over quantitative expansion. City data showed that the city spends about 4.9 billion won each year for maintenance and repair of bike roads. The Seoul city government said it would also form three Ttareungyi special zones in Seoul. The special zones will allow citizens to commute to work and school and go shopping via the public bikes. The goal is to work in connection with urban development projects to build various infrastructure, such as bike paths and rental spots at the planning stage to form residential districts optimized for public bike usage. As of December last year, about 27 accidents been reported with Ttareungyi bikes on the road. Most were reportedly caused due to the inexperienced bikers. “The maximum speed for Ttareungyi is about 20 kilometers per hour,” said a Seoul City official, adding there’s less likelihood for riders to be involved in accidents in such situations.